﻿﻿﻿﻿﻿﻿﻿﻿﻿How long have you been a stitcher and how did you first learn about stitching? I did my first cross stitch project in the late '70's (I'm dating myself here) when I was curious about the needlework a co-worker was stitching on our lunch break. A quick lesson later, and I was a convert! I had tried crewel embroidery in the past and had not been successful at it, but cross stitch really seemed to be the perfect fit for me. 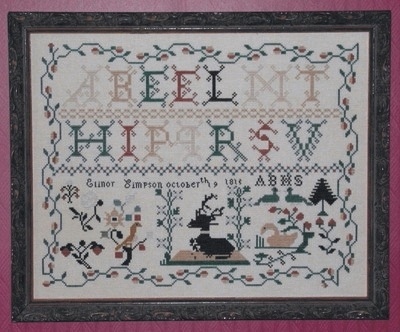 In the mid-'80's I discovered reproduction samplers, and found my niche in the handwork of stitchers young and old from centuries ago. When did you begin designing your own patterns and how did that turn into a business? I published my first design (the Elinor Simpson 1815 sampler reproduction chart) in 1998 at the urging of my good friend Edna Medlin of Threads of Gold designs. Edna encouraged me to try my hand at charting some of my own antique samplers. I found that this was a wonderful and very satisfying outlet for my creativity, and have since branched out into producing some original designs of my own. 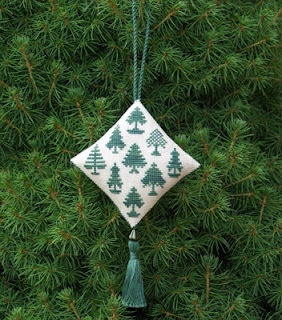 I try to do an annual Christmas ornament, based on motifs from antique samplers, and I have also done several collaborations with Liberty Hill, such as the Acorn Harvest Threadkeeper. What are a few of your favorite themes when designing a pattern?I love samplers and original designs with houses, acorns, and cats, to name my top three motifs. 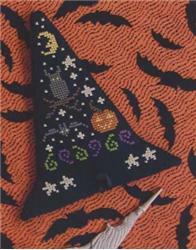 Halloween and spooky-themed designs are also high on my list of favorite cross stitch themes. Do you stitch your own models, or do you have model stitchers?I design a chart on my computer and then stitch my own models from the charts. This helps me to catch errors in the charts before publication. Even though I am a slow stitcher, the main advantage to me in doing my own model stitching is that I can determine quickly if thread colors are not working, or if they do not closely match the colors in the antique sampler I'm reproducing. This allows me to change colors before the stitching progresses too far. What's your favorite holiday and why?My favorite holiday is Halloween and favorite season is autumn. I attribute this to having been born in the month of October, but Halloween is such a fun holiday, and there have been so many cross stitch designs to celebrate it that it has become the favorite holiday of many. Living here in the south, the summers are so long and hot that it's always such a refreshing time of year when the cool winds begin to blow. I always feel renewed and energized at this time of year. I have two beautiful cats, Anna and Misha. 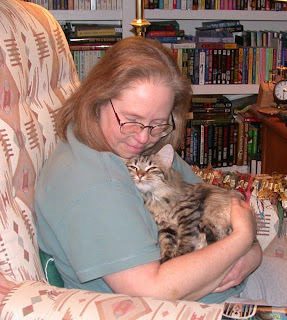 Misha is a full Siberian and Anna is half Siberian and half Ragdoll. She is my sweetie girl, the sweetest and most empathetic cat I have ever owned. I sometimes think that she can read my mind because it seems that she can tell my mood by just looking at my face. Her only vice is that she loves to bite plastic bags - not a good thing for a cross stitch designer, as I used to have plastic bags everywhere. But Anna's love of plastic bags has forced me to clean up my workspace whenever I'm done for the day -- something my husband would say isn't a bad thing, after all. If you could be an animal, which would you pick and why?I love cats, and could definitely get into being one of our pampered felines. What's the saying: A dog has owners, but a cat has staff. Would you like to share a favorite recipe?A favorite recipe of mine and my husband's came about by accident. Several years ago I was suffering from a cold, and having heard about the supposed healing powers of chicken soup, I decided to try a recipe I had come across that sounded interesting. I think my congested brain confused some of the measurements, but what I ended up with was some very good chicken noodle soup. I can't vouch for its healing powers, but it is quite tasty and easy to make, and my husband requests it about once every couple of months or so. Owner Debbie E Schantz, partner mother, "Dit" now retired, stitching all the time! In 1981 my Mother, "Dit" and I visited a cute little shop in South Carolina. They carried craft items and had a Counted Cross Stitch corner. I had already tried CCS, and my Mother tried it after and enjoyed it too! We visited the shop several times over the next few days and were inspired. 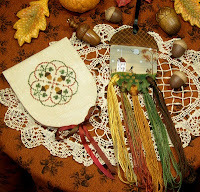 Mother was very crafty and my sisters and I learned young about needlework and crafts. When we returned home we continued to talk about a business as we realized we were "hooked" on cross stitch. After many months of planning, I attended a needlework show, we found a vacant shop, and we went into business as Stitch N' Stuff by Dit and Debbie. We were anxious to show people how to do counted cross stitch, not in our area at that time. However, we were amazed to find an established group of stitchers already in our area, happy to find a local place to get their supplies. How do you compare the products that are available in today's market compared to 10 years ago, and how that has changed your business over time? A lot of things have changed over the years. In the beginning most people worked on Aida cloth. DMC was used almost exclusively and YOU NEVER CHANGED THE COLORS! (We certainly don't limit ourselves that way today.) Slowly stitchers moved on to using linen and different fabric colors became available. The next trend I believe was using buttons as accents. Today there are many types of threads and multitudes of fabrics, many many colors and counts. Maginification accessories make stitching on fine fabric easy! Who are some of your personal favorite designers? Over the years some of my favorite designers (companies) include Shepherd's Bush, the Prairie Schooler, and Lizzie Kate. I just don't seem to have much time to stitch regularly, however, I did make a baby sampler for my grandson, OH BABY! by Lizzie Kate! We have customers who remember my son Alan playing I the shop in his preschool years. A Christmas stocking is probably in the future for me to stitch. What are some of the biggest changes in the industry and how do you make use of it for your company? Mose recently the computer has changed our business. Yes, it's easier for people without a local shop to get supplies. But I have had to learn a new skill, and needed people to help me learn, it's an ongoing process. (I wish my husband was a "tech-man"). Nothing replaces a trip to a shop to see in person new cross stitch designs, but you can find charts that we do not have in the shop, creating more ordering and shipping for those not local. But we have made lots of new friends and customers over the computer too. We mail everyday and I can place orders by email, and do them at whatever time I can find, not just during established business hours. Just like you, if you can't sleep, you can order from us during the night, and many of you do! The biggest disadvantage to the computer, we're spending too much time on it and NOT STITCHING! How can we get the next generation of stitchers started? I would like to get new, and more, yound stitchers. I have been askign designers at needlework shows to designs for young people, and wasy projects to get them interested. 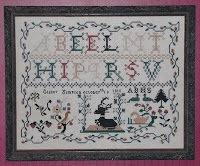 Counted Cross Stitch is a wonderful hobby, let's pass on this joy of stitching!! I've been married for 37 years, with 1 son, also happily married and a new Grandson! Stitch N Stuff started in 1981, and we moved to our current location in 1987. We have 10 employees, everyone has been with me for "years". Besides stitching and running your business, what are a few things you enjoy in your free time? In addition to stitching, I love to read and play golf. My parents have always been my inspiration, cheerleaders and role models! Layer the rest: first lettuce, then tomatoes, onion, and cheese. Keep cold and serve with your favorite style dipping chips! Linen 101 & Trivia Contest!